Thanksgiving and Praise - 1. The Construction Fund has now reached its target which means we now anticipate having enough money to complete phase 1 of construction of the hospital. 2. We have had no serious injuries or health issues since we started this job despite men working in over 100 degree heat and now working 12 hour shifts 6 days per week. 3. By Gods grace we have kept to budget and timeline, there have been no major hurricanes to disrupt construction. 4 The incredible willingness of the Cattle family to give up a very comfortable life for two years to move and live in a tiny 2bed home, accept their daughters have to be educated at the site with just a couple of other missionary kids, Julian to work tirelessly on the project and Marie has become a central linchpin in working with the hospital using her background as a nurse to great effect. I have not heard a single complaint from them in two years. 5. 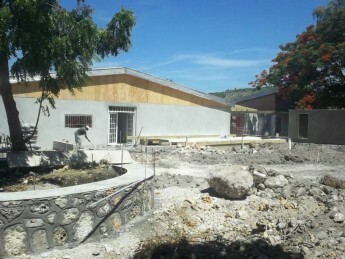 We have trained Haitians to the extent that we were even able to add in a 12 classroom school and latrine block into our construction programme without moving the hospital date back, this new school will open the day before the hospital. 5. Protection for the entire team, Dan and Joy have seen incredible spiritual attack.